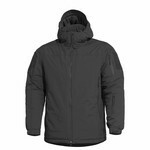 LCP VELOCITY, Lichtgewicht, maar super warme Winterjas. Ademend, Waterproof en winddicht. Geschikt voor extreme temperaturen van -20° celcius onder nul. Laminated with a Storm|Tex­™ Water-proof membrane that offers WP 5000mm/24H and MPV 5000gr²/24h breathability. suitable for cold weather comfort zone -15° and extreme -20° celcius.